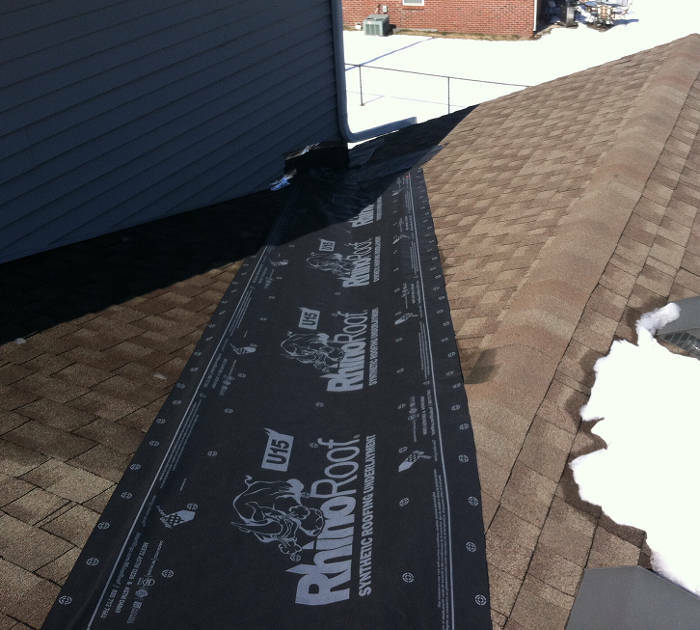 Many thanks to Thumbtack.com for rating us as the Top Roofer in Nicholasville, KY! As a result, we were able to help a wonderful couple with our emergency roof repair service in Wilmore. We get a lot of opportunities from this outlet. However, this particular project stood out to us, so we wanted to share it with other local homeowners. Tony and Lisa had a really bad leak that had soaked their blown insulation and pretty much destroyed the drywall ceiling and wall in their master bedroom. 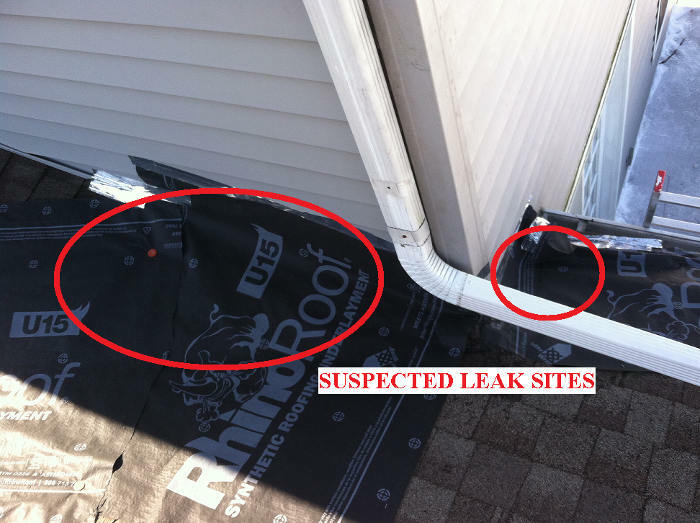 They went on Thumbtack to find a contractor to inspect the roof, determine what was causing the leak and provide a quote to have their issues remedied. See why the snow and ice causes your roof to leak. Seeing that the next 6 days were going to bring plenty of rain and knowing they already had a bucket under the leak, we decided it was best to provide an emergency temporary repair to keep the interior damage from getting worse. We removed the ice and snow, nailed down synthetic felt along the entire valley and put together a makeshift channel to redirect the flow of water. This all took about 45 minutes and I could see the look on their faces saying, “uh oh, I hope there’s not a charge for this”. They were not aware that we provide “emergency temp roof repairs” at no charge. After we were finished making sure they wouldn’t have problems with the coming rains we moved onto our next step. I measured the damaged roof area and interior and assured this nice couple that they wouldn’t have to worry anymore. I let them know that I would email them an itemized estimate by sundown. Lisa compared our estimate to the other quotes she had already taken and even though it wasn’t the least expensive, she and Tony decided to use us after checking out the background of each roofing contractor. We took a 50% deposit and started the next day, just in time to beat the rains! They liked the quality of the work so much that they ended up asking us to come back to paint more of the house and gave us raving reviews! 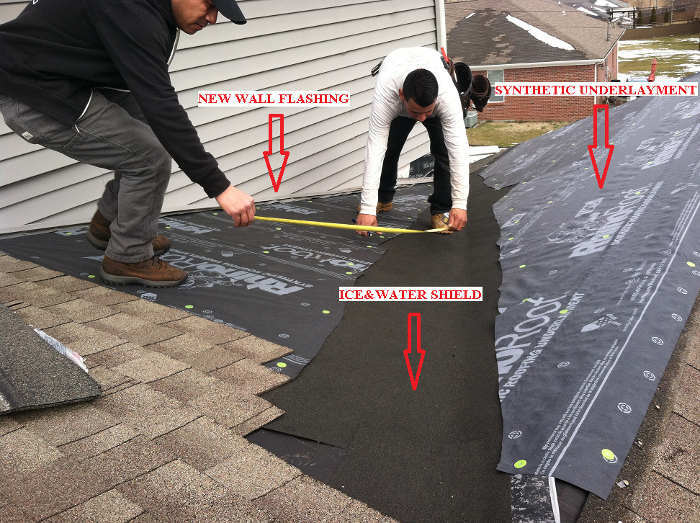 With all the snow and ice this year, we ended up with a nasty leak and went searching online for a few reputable contractors to figure out what was going on with our roof and get quotes. Lexington Blue was the second professional we contacted through Thumbtack. He came out as scheduled the next day, inspected the leak and performed a temporary repair for us at no charge. He then proceeded to offer a series of solutions and answered all of our questions. Within 4 hours of leaving, the quote we requested was delivered via email. We accepted the offer and two days later, he and his staff were on-site as promised. The roofing portion of the project was finished within 1 day and the interior was finished the following day and looks great. We highly recommend this company to all Wilmore and Nicholasville residents! Thank you, Lisa and Tony! It’s people like you that make our job fun! Below is an outline of our repair process from start to finish. 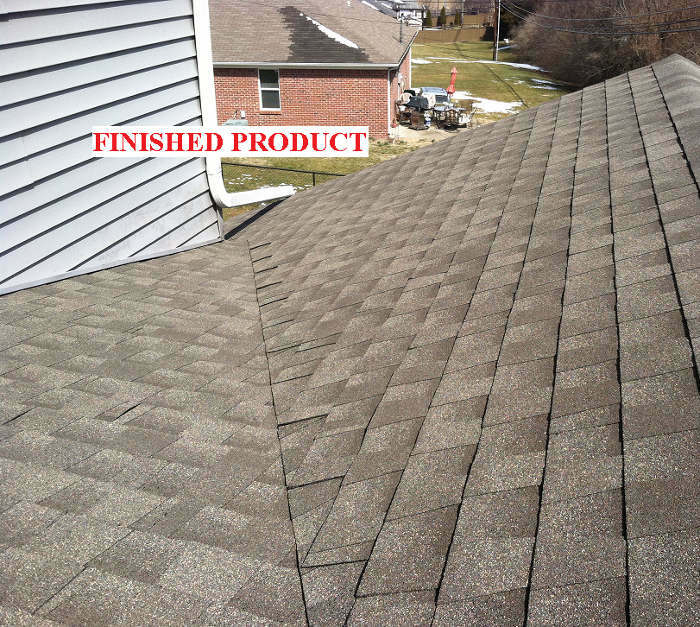 Removed Shingles in immediate area. Contact us @ 859.368.6346 for any roofing related services in central Kentucky.